This lithograph is taken from plate 25 of William Wood's 'Views of Calcutta'. 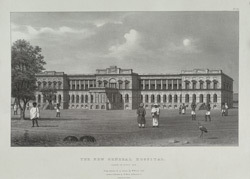 The General Hospital stood on the southern edge of the Calcutta Maidan facing Fort William. When Wood made his sketch in 1829, it was known as the New General Hospital, and was built on the site of the old. It had been substantially enlarged in the 1820s.